Manchester United hosted Arsenal at Old Trafford in the Premier League during an entertaining encounter that ended 2-2. The Red Devils came back twice, with Arsenal being gifted goals from poor mistakes, the first by De Gea, the second via a Rojo own goal. However, Anthony Martial and Jesse Lingard were able to ensure that the side took home one point from the fixture, with their recent form still in a doubtful spot. Towards the end of the game, the pressure was there on both sides to try and win it all, and this passion was apparent in the manner in which they were functioning. However, in the midst of this, a disgraceful act occurred, and it was from an unexpected source. In the midst of the dying minutes, Marouane Fellaini, who was brought on as an impact substitution, was seen pulling the hair of Matteo Guendouzi. 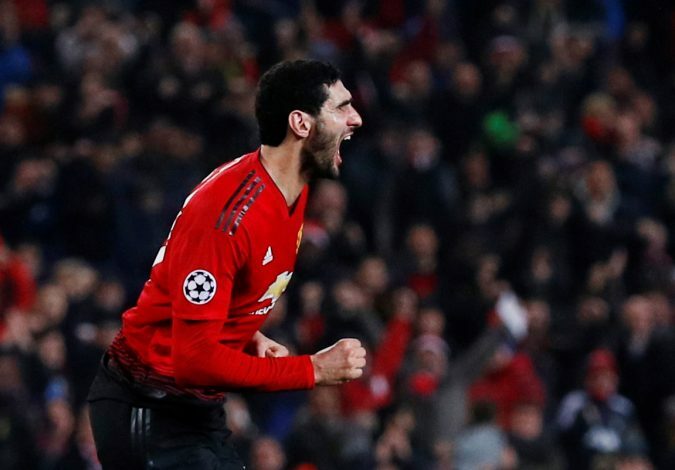 This will come as a shocker to many, given how Fellaini sported an iconic afro till very recently, and he of all people ought to have been empathetic towards the act. Despite that, the Belgian’s actions were right there for all to see, and needless to say, Twitter didn’t take too lightly to it. Some even joked that perhaps the act was one of envy now that the player himself no longer has a stand-out hairdo. What surprised many was that the midfielder wasn’t shown a card for his antics, a decision that ought to have occurred given the sheer brashness of the act. It will be interesting to see if there are any post-match repercussions for this deed. The end result of the fixture means that United are now eight points behind the Gunners, and prospects of a top-four finish look increasingly doubtful already, despite an entire half of the campaign remaining.